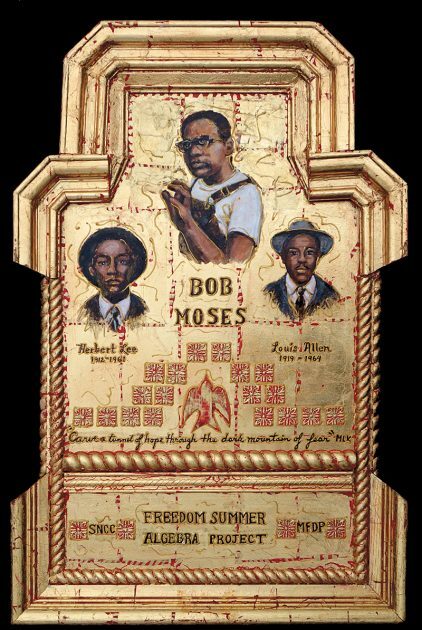 Robert Parris Moses (usually known as “Bob Moses”) was born January 23, 1935. He grew up in Harlem, attended the elite Stuyvesant High School, was awarded a scholarship to Hamilton College and earned an MA from Harvard. He planned to continue his PhD at Harvard, but due to the death of his mother and the illness of his father, he returned to the Bronx and in 1958 became a mathematics teacher at the Horace Mann School. Only a short time later, he would become one of the most influential activists in the Civil Rights Movement. During his summer break from teaching in 1960, through the urging of Bayard Rustin, Moses went to Atlanta to work with Martin Luther King, Jr and the Southern Christian Leadership Conference (SCLC). There he agreed to travel throughout the South on a recruiting tour for the Student Non-Violent Coordinating Committee (SNCC) which shared an office with SCLC. The next summer Moses worked on voter registration in Mississippi soon joining the small SNCC staff as a field secretary with an emphasis on voting rights. Though a quiet young man who was reluctant to promote himself as a leader, Bob Moses nurtured local people in his vision of a grassroots community-based system which could continue after the organizers had left the area. After decades of disenfranchisement under Mississippi’s voting rules, blacks no longer even tried to vote. For his voter registration efforts, Moses was harassed, beaten and arrested. In one case, Moses filed assault charges against his attacker who was acquitted by an all white jury. The judge warned Moses that he could not protect him and had him escorted out of the county. A month later, in September of 1961, a white state legislator, E.H. Hurst murdered Herbert Lee, a 50 year old local farmer who had driven Moses from farm to farm to talk about voter rights. Lee was killed as he was pulling up to a cotton gin with a truckload of cotton. Hurst was cleared of charges on the claim of self-defense. A black man, Louis Allen, was one of the witnesses to Lee’s killing. Afraid for his own life, he supported Hurst’s account, but his conscience bothered him. He finally told federal authorities that he had actually seen Hurst shoot Lee in the head after forcing him out of his truck. In spite of Moses’ appeal to the Justice Department for Allen’s protection, he was murdered for setting the record straight. 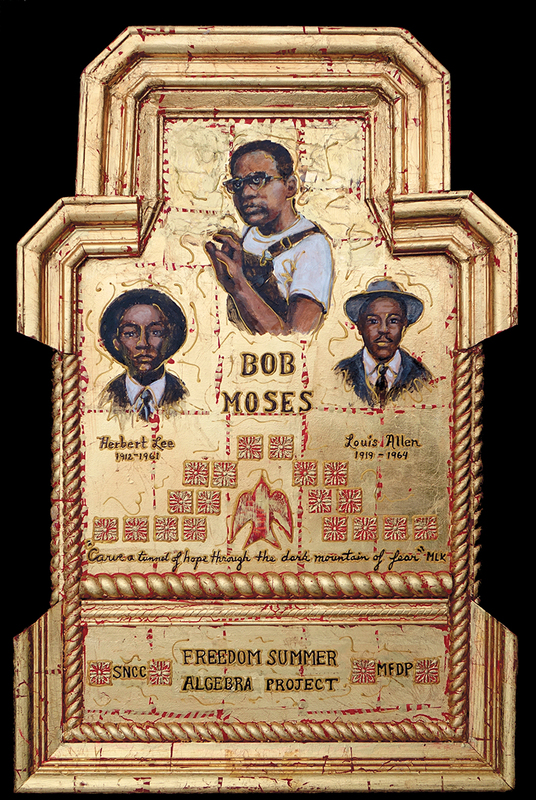 In 1964 Bob Moses was a main organizer of The Mississippi Freedom Summer Project which was intended to achieve widespread voter education and registration. Freedom Summer brought mostly white college students from the North to Mississippi. After weeks of training, the students lived with local black families, set up Freedom Schools for children and taught adults how to register. As they were still in training, three other civil rights workers, Andrew Goodman, James Chaney and Michael Schwerner, were reported missing and later found murdered. Moses calm leadership contributed to the volunteers unwavering commitment to the project. That same summer, with Fannie Lou Hamer, Moses became one of the originators of the Mississippi Freedom Democratic Party which, at the Democratic National Convention that September challenged the all white delegation on the convention floor. Media coverage called attention to the lack of black representation within the party, leading to a change in the party’s convention rules. Later he returned to Harvard to complete his PhD in the philosophy of mathematics. In 1982, he received a MacArthur Foundation “Genius” Award using it to promote The Algebra Project, a national program he developed to improve math skills of children in poor communities. By 2000 over 200 schools were using the methods of the Project, thereby improving students’ chances for college acceptance.